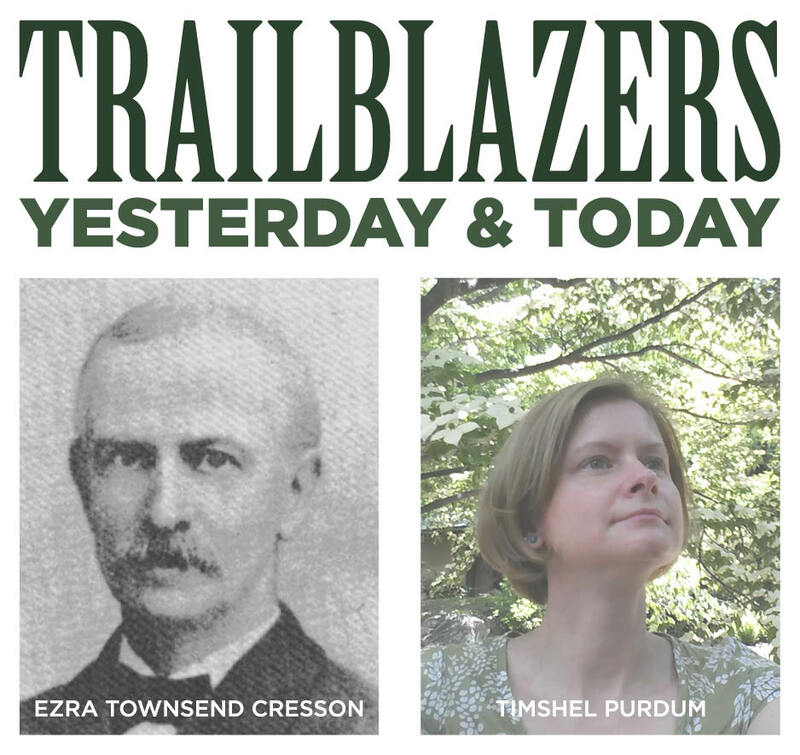 We're excited to introduce a new element that will be featured in our e-newsletters and blog: Trailblazers, Yesterday and Today! Each month, we'll profile a different "resident" of The Woodlands along with their contemporary counterpart. For our inaugural edition, we're featuring Ezra Cresson and Timshel Purdum! Ezra Townsend Cresson (1838-1926), who is buried in the Cresson Family Lot at The Woodlands (Section D, Lot 193), founded the American Entomological Society in 1860 and was involved in the Society for 65 years after its founding. Cresson dedicated his life to entomology, or the study of insects--specifically that of Hymenoptera, which include ants, wasps, sawflies and horntails. He discovered hundreds of new species of hymenoptera, and published numerous articles on the subject throughout his life. In 1860, Cresson gave his entire collection of more than 60,000 beetles and wasps to the Academy of Natural Sciences of Drexel University. The American Entomological Society, the oldest entomological society in the Americas, still holds meetings at the Academy today. The Cresson family has been referred to as "The First Family of the American Entomological Society," as Cresson's two sons George Bringhurst Cresson and Ezra Townsend Cresson, Jr. followed in their father's footsteps, contributing greatly to the AES in their lifetimes. In honor of the upcoming Firefly Night and The Woodlands' very own Ezra Cresson, we had a few questions for Ms. Timshel Purdum, the Director of Education and Lifelong Learning at the Academy of Natural Sciences of Drexel University, about how Cresson and his founding of the American Entomological Society over 150 years ago has impacted the Academy. What is your background, or, how did get to where you are today? It was a circuitous route, but I hold a B.S. in Biology and M.A. in Environmental Education, with many years volunteering at museums. And as far as bugs go, I'm not an entomologist—but my father was an amateur Lepidopterist and he raised giant silkworm moths in our house such as Luna and Cecropia moths. How has the American Entomological Society (AES) and Cresson's collection positively impacted what the Academy does today? The AES still holds its regular meetings at the Academy of Natural Sciences of Drexel University! The department's collections currently contains more than 3,500,000 specimens--of which more than 11,000 are types. A type specimen is THE example that serves to anchor or centralize the defining features of that particular species! Some of the types are from Cresson’s collection. And we love bugs so much that our entomologists and education staff host a Bug Fest every year in August (this year our Bug Fest is August 10 and 11), where we do all things buggy--including opportunities to see specimens from our collections that are not usually on display. What is your favorite part about or piece in the collection? My favorite part of our entomology collection are not Cresson’s but the butterflies of Titian Ramsey Peale. Some of these butterflies he put together in glass bound “books” called Peale Boxes. They look like a regular book until you open the cover. Inside is a glass box with mounted butterflies that you can see from the front and back. They are beautiful. If you could ask Cresson one question, what would it be? I am fascinated by the hymenoptera too (bees, wasps, ants). Social insects amaze me. I'd ask Cresson what fascinated him about these insects. Thanks for talking with us, Timshel! If you have an idea for a Trailblazer feature, send us an email!